DCE Scholarship, also known as Kerala scholarship is a broad term for scholarships that are being run by the Government of Kerala and its subsidiary departments. Every year, the government of Kerala calls for applications for a number of scholarships to ensure that finances do not remain a constraint in the pathway of students while they are in pursuit of their dream academic career. A DCE scholarship is applicable for students coming from different strata of life. The key objective behind introducing these scholarships is to provide suitable financial assistance to meritorious and deserving students of Kerala state. Which Kerala scholarship is available for you? How many such scholarships are there? Where and when can you apply for them? What is the amount of scholarship that you will receive? Get answers to all your questions related to DCE scholarship in this article. It provides you with an in-depth information about the Kerala scholarships such as the complete list, their eligibility, application process, application period, rewards and more. Look up for scholarship that fits your custom requirements and apply for them accordingly. Whether you are looking for a DCE scholarship at school level or college level, you can find one scholarship for yourself in the table given below. A total of 16 Kerala scholarships are available for you that are being run by the central government and the state government. The key departments of the government of Kerala, which offer the scholarship for students of the state include Department of Minority Welfare and Department of Collegiate Education. Get detailed list of Kerala scholarship along with their provider information and tentative application period in the table given below. Do you know the key eligibility condition which is common for all DCE scholarships? Probably not. To be eligible for a Kerala scholarship, you primarily need to be a permanent resident or domicile of Kerala state. Besides this, there are other conditions too, that you need to fulfil to be eligible for any DCE scholarship. What are those conditions? Know detailed eligibility criteria for each scholarship in the table given below. The scholarship is open for students who belong to Minority community (Muslim, Christian, Parsi, Sikh, Buddhist and Jains). They must be pursuing an ITI course. The annual income of the family should be less than INR 8 Lakh per annum. This Kerala scholarship is open for girl students only who belong to Muslim, Latin or converted Christian community. They must be pursuing studies at graduation level or above. The percentage of marks to be obtained by them in the last qualifying examination should be 50% or more. The students studying in self-financing colleges from merit seat can also apply. The hostel stipend is available only for students residing in recognised hostels. The students belonging to Minority community (Muslims, Sikhs, Christians, Parsis, Jains and Buddhists) can apply for this scholarship. They must be studying in a government/aided polytechnic in a merit seat. The candidates belonging to Minority community (Muslims, Christians, Sikhs, Parsis, Jains and Buddhists) can apply for this scholarship. They must be pursuing their education at class 10, 12 and VHSE. The annual income of the family should be less than INR 8 Lakh from all sources. The students belonging to Minority community (Muslims, Christians, Sikhs, Parsis, Jains and Buddhists) can apply for this scholarship. They must be pursuing a nursing diploma/paramedical courses. The annual income of the family should be less INR 8 Lakh from all sources. The students belonging to Minority community (Muslims, Christians, Sikhs, Parsis, Jains and Buddhists) and pursuing CA/ICWA/CS courses can apply for this scholarship. The minimum percentage of marks to be obtained by them in the last qualifying examination should be 60%. The students pursuing studies at higher secondary, VHSC, ITI or Polytechnic course can apply. They must have passed the SSLC examination conducted by the Board of Public Examination, Kerala State with an ‘A’ plus grade in all subjects. The students pursuing studies in the first year of an undergraduate or postgraduate course in a government/aided college or university can apply. The minimum percentage of marks to be obtained by them in the qualifying examination should be 50% or above. The scholarship is open for students pursuing undergraduate or postgraduate degree course with Sanskrit as a subject. The scholarship is open for girl students only who belong to forward of BPL family and backward community. The students studying in a Government Music College or Government Fine Arts College can apply for this scholarship. This scholarship is applicable for blind/physically handicapped/deaf students. They must be pursuing their studies in a government/aided Arts and Science Colleges, Music Colleges, Higher Secondary/Vocational Higher Secondary schools. Students pursuing an undergraduate or postgraduate course with Hindi as a subject can apply for this scholarship. The scholarship is applicable for students who are in the first year of any undergraduate or postgraduate degree programme. They must belong to a BPL family. The minimum percentage of marks to be obtained by them in the last qualifying examination is 50% or above. The scholarship is open for students who belong to minority community (Muslims, Christians, Sikhs, Parsis, Jains and Buddhists). They must be pursuing their studies from class 11 to PhD level. The minimum percentage of marks to be obtained by them in the qualifying examination should be 50% or above or equivalent grade. The students, who are above the 80th percentile of successful candidates in class 12 from respective Board of Examination can apply for this scholarship. They must be pursuing regular degree courses at undergraduate or postgraduate level from institutions/colleges recognised by AICTE/UGC/MCI/DCI or any other regulatory authorities. 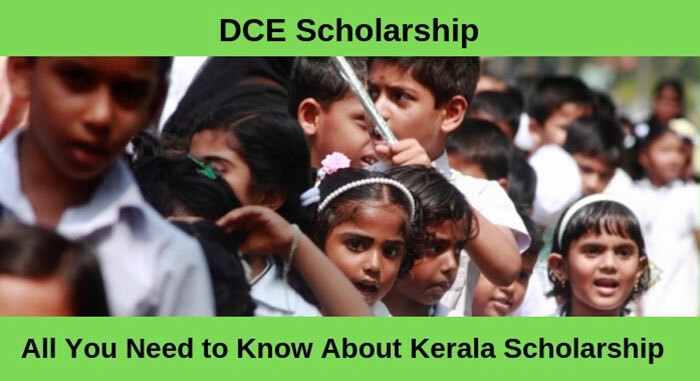 How and where can you apply for a DCE scholarship or Kerala scholarship? Is the application available online or offline? Know everything about how can you apply for these Kerala scholarships in detail in the table given below. Considering the advanced technology world, all the scholarships prefer the online mode of applications through two major portals of Government of Kerala namely, Minority Welfare Scholarships Portal and Department of Collegiate Education’s Online Scholarships Portal. Also, the Kerala scholarship which is run by the central government invites application through its National Scholarship Portal. 1. ITC Fee Reimbursement Scholarship, Kerala Apply online through Minority Welfare Scholarships Portal. 2. C H Muhammedkoya Scholarship, Kerala Apply online through Minority Welfare Scholarships Portal. 3. APJ Abdul Kalam Scholarship (APJAK), Kerala Apply online through Minority Welfare Scholarships Portal. 4. Prof. Joseph Mundassery Scholarship Award (PJMS), Kerala Apply online through Minority Welfare Scholarships Portal. 5. Mother Teresa Scholarship (MTS), Kerala Apply online through Minority Welfare Scholarships Portal. 6. CA/ICWA/CS Scholarship (IWCS), Kerala Apply online through Minority Welfare Scholarships Portal. 7. District Merit Scholarship (DMS), Kerala Apply online through Department of Collegiate Education’s Online Scholarships Portal. 8. State Merit Scholarship, Kerala Apply online through Department of Collegiate Education’s Online Scholarships Portal. 9. Sanskrit Scholarship (SSE), Kerala Apply online through Department of Collegiate Education’s Online Scholarships Portal. 10. Muslim Nadar Girls Scholarship, Kerala Apply online through Department of Collegiate Education’s Online Scholarships Portal. 11. Music Fine Arts Scholarship (MFAS), Kerala Apply online through Department of Collegiate Education’s Online Scholarships Portal. 12. Blind/PH Scholarship, Kerala Apply online through Department of Collegiate Education’s Online Scholarships Portal. 13. Hindi Scholarship (HS), Kerala Apply online through Department of Collegiate Education’s Online Scholarships Portal. 14. Suvarna Jubilee Merit Scholarship (SJMS), Kerala Apply online through Department of Collegiate Education’s Online Scholarships Portal. 15. Post-Matric Scholarship (PMS) for Minorities, Kerala Apply online through Department of Collegiate Education’s Online Scholarships Portal. 16. Central Sector Scholarship (CSS), Kerala Apply online through the National Scholarship Portal (NSP). The amount of scholarship that each DCE scholarship offers to the students vary from scholarship to scholarship. It also depends on the current class in which you are studying. Each Kerala scholarship offers a substantial amount of reward to students through Direct Benefit Transfer (DBT). Know what it holds for you in the table given below. It contains a detailed description of the award details of each scholarship. Also, you will get know the duration for which the scholarship is tenable and the number of scholarships available in some cases. INR 10,000 for students pursuing the 1-year course. INR 20,000 for students pursuing the 2-year course. INR 10,000 for each selected scholar at different levels. For undergraduate course – 55 scholarships of INR 200 per month to each scholar. For postgraduate course – 25 scholarships of INR 200 per month to each scholar.